The integrated approach of the traditional Indian worldview perceived truth goodness and beauty (Satyam, Shivam, Sundaram) as inalienable aspects of that state of being called Brahman and all arts were conceived as paths to this exaltation of mental effort with aesthetic fulfillment or rasa identified with what Dr. Ananda commoraswamy described as the self perceiving the self or the micro becoming one with the macro. The arts demand a willed introversion of a creative mind with all arts being regarded as means rather than ends in themselves. So a state of mind rather than aesthetic intention becomes important Pretty art emphasizing passing feeling and personal emotion is neither beautiful nor true. In such an approach the spectator plays an active role his ability to really experience rasa needing a degree of initiation into the art form to be able to appreciate its finer aspects. This appreciation or experience of rasa is described by Vishvanatha compounded Darpana, it is pure indivisible self manifested compounded equally of jay and consciousness, free of admixture of any other perception the very twin brother of mystic experience (Brahmasvaadana Sahodarah) and is enjoyed only by those with are competent. This experience thus does not exist apart from its are competent. This experience thus does not exist apart from its are competent. Just as the reality of love is experienced by the love and truth is reality experienced by the philosopher so beauty too is reality experienced by the artist and the initiated spectator. Beauty in this approach is a state of being and does not exist apart from the artist and the Rasika who enters into the experience. With dance having entered the proscenium art as a pure physical construct has come important and much of the purpose behind the art from has been relegated to the background of the thinking mind. 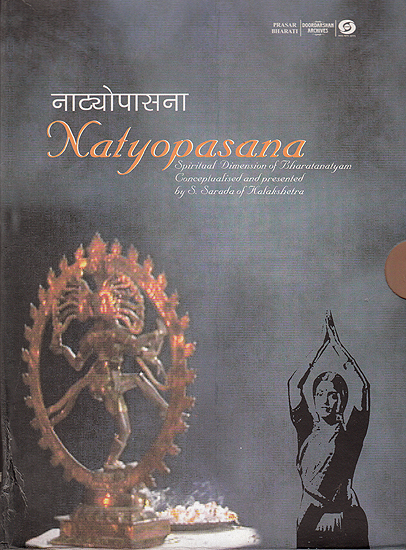 Which is why natyopasana designed by S. Sharada has special relevance in the present climate when dance is looked art for its visual appeal more than anything else, for this series of episodes reaffirm the philosophical and metaphysical aspects of the dance which constitute the way of what the dancer does. S. Sharadas for years worked with late Rukmini Devi Arundale who institutionalized Bharatanaytam for the first time, incorporating in the training several disciplines blending and contributing to the dance like music, philosophy languages and all the visual arts thereby giving the student an integrated approach enabling her to understand the dance as being much more than just creating aesthetic movement.